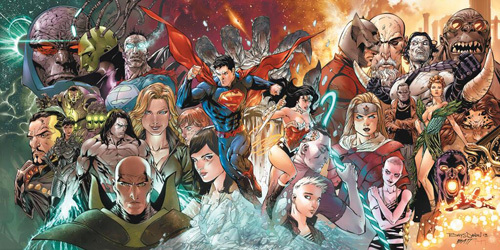 I’ve written at length already about why I’m not a fan of the New 52, DC Comics’ linewide relaunch that’s been the status quo since 2011. One of the things I particularly dislike is what’s been done with Superman. While a few other characters such as Batman and Green Lantern continued more or less where they left off, Superman was rebooted entirely. He has a silly costume redesign, he’s younger and “edgier,” and his marriage to Lois Lane never happened. In fact, now he’s going out with Wonder Woman. This last part is something I’m really not down with, for reasons I’ve also written about at length already. I’m all for Wonder Woman having a romantic interest, because she’s hardly had one for decades, but hooking the big, strong woman up with the bigger, stronger man feels regressive somehow, especially because the whole Amazon credo is to never allow themselves to be dominated by men again. But again, I’ve written about that all before. The whole Superman/Wonder Woman romance hasn’t shown up in the current Wonder Woman series at all, as Brian Azzarello has a different story he’s telling, verrrry slowly, and it’s all about the gods. But it’s been a big deal in Geoff Johns’s Justice League series, and now it’s been spawned its own spinoff series. 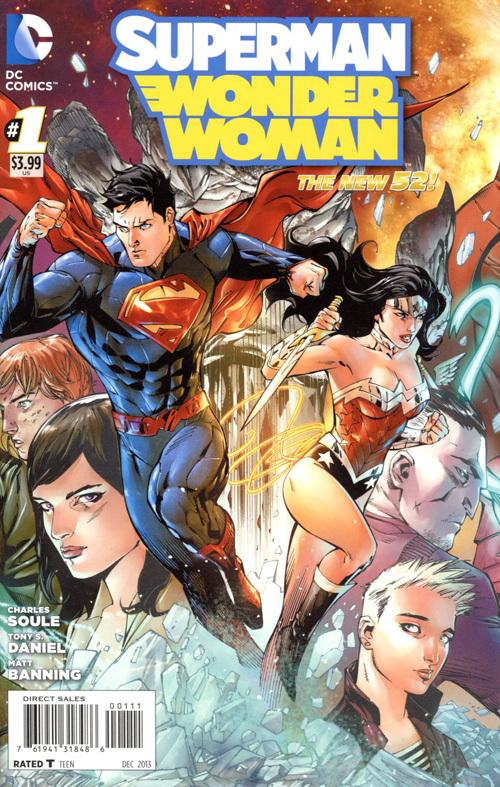 Superman/Wonder Woman is the first ongoing series starring the pair, though they’ve had miniseries together before. I’m certainly not opposed to a regular team-up title on principle, because I’ve always liked the friendship between the two, even if that was a completely different Superman and a completely different Wonder Woman that I’m remembering. And I’m thrilled to have Wondy headlining multiple titles, because while that’s normal for Superman and Batman, it doesn’t happen with her very often. Speaking of Superman and Batman, it’s rare for those two not to have an ongoing team-up title together. For many decades it was World’s Finest, then Superman/Batman before the reboot, and now Batman/Superman. So it’s kind of cool for Wonder Woman to get into that action. It’s just too bad that she and Superman have to be an actual couple to make it happen. I guess that teenage girl in the left is Lois Lane. 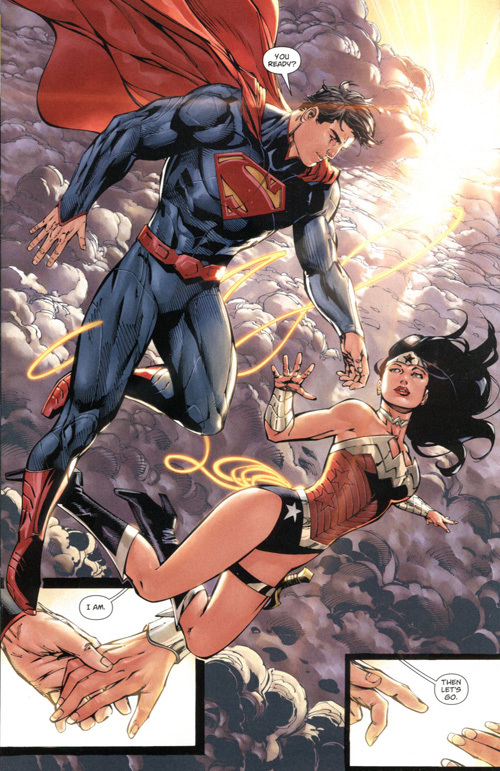 Superman/Wonder Woman #1, DC Comics, December 2013. The first issue came out today, and, well, it’s hard to know what to think of it. Not much, anyway. Like TV show pilots, first issues aren’t necessarily the best indication of how the series will go. But nowadays it’s almost for the opposite reason. TV pilots try to cram as much of the concept and feel of a series into one episode that they often seem frantic, whereas comic-book stories are so drawn out nowadays that hardly anything ever happens in a single issue. It’s written by Charles Soule, who’s written some indie comics I’ve never heard of—27 and Strongman—and who’s taking over writing duties on DC’s Swamp Thing and Red Lanterns and Marvel’s Thunderbolts. The art’s by Tony S. Daniel, who was the writer/artist of the relaunched Detective Comics when the New 52 started. Here it is in its full glory. Such as it is. There are multiple variant covers, but the main one is a big ol’ fold-out wraparound cover by Daniel showing the two heroes surrounded by their respective villains and supporting casts. The trouble is, because both of them have been recently rebooted, they haven’t accumulated a whole lot of familiar faces, and a lot of the old ones are only semi-recognizable in their new versions. Still, it’s a decent cover. The whole thing seems to be about making things pretty, at least in this first issue, because, you know, it’s a romance. I mean, the title of this issue is “Power Couple,” for chrissakes. It starts with Superman and Wonder Woman flying through the skies together, because that’s pretty romantic, although of course it turns out that they’re flying off to save the day. But from what? Well, we’ve got a lot of flashback to get through before we get to that. Something to do with storms, anyway. I still can’t stand that stupid collar. Or that stupid belt, Or those stupid sleeves. 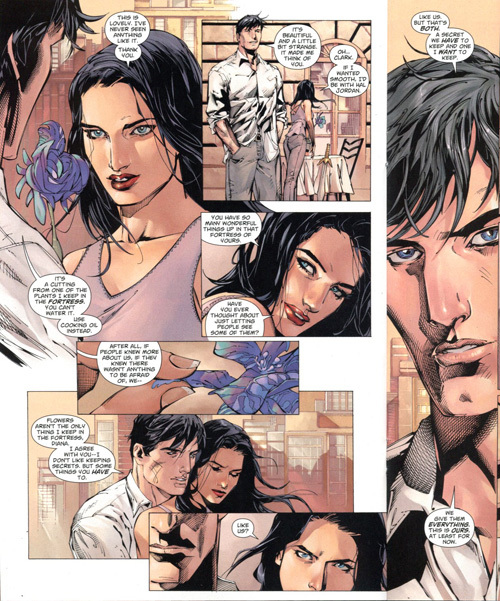 There’s a bit of character stuff with Clark Kent and Cat ummm…. I don’t remember what her name is. Oh wait, yes I do, Cat Grant. Or at least that’s what it was before the reboot. She used to be a gossip columnist for the Daily Planet, but that was in the old continuity. Now it looks like she and Clark are working on some “indie news blog” together. I dunno, I don’t read Superman comics anymore. 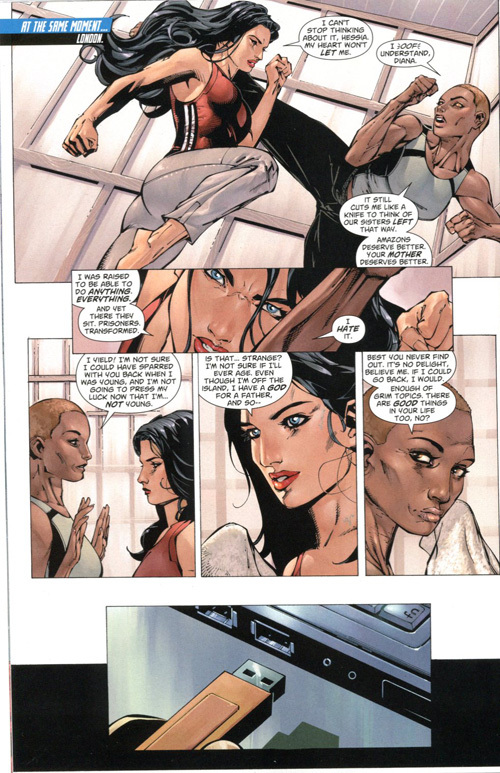 Meanwhile in London, Wonder Woman is working out with an Amazon friend named Hessia whom I don’t know if we’ve ever seen before. And wait, weren’t all the Amazons turned either into snakes or to stone? I may be a little behind because I read Wonder Woman in trade collections rather than monthly, but I don’t know where the heck this Amazon came from. Seriously, lady, who are you? And of course Diana starts talking about how her dad is Zeus, which is her new thing. The old Wonder Woman didn’t even have a dad; her mom made her from clay. The new version is just another product of Zeus’s pants problems, and that’s been pretty much all anyone can talk about in Azzarello’s Wonder Woman series. Being an Amazon used to largely define her, but now it’s all about her dad. Score one for the patriarchy. All she can talk about in this issue, however, is how Superman wants to keep their relationship secret and she would prefer everything out in the open. But she doesn’t really challenge his wishes, just questions them. Now in my experience, keeping relationships on the down-low is usually a bad sign—you can say it’s to keep everyone out of your business, but it’s usually more about hedging your bets and keeping your options open. But this whole relationship started because both of them felt they couldn’t date ordinary mortals because they could too easily be hurt or used as leverage against them, so dating each other seemed like pretty much the only way either of them were going to get any action. Those are the kind of relationships they’d have to keep secret to keep everyone safe, but with each other…. well, Clark says, “We give them everything. This is ours. At least for now.” And that sounds a lot like the nobody’s-business doubletalk I was just talking about. But of course this is a guy who has a Fortress of Solitude, so he’s into his privacy—an analogy that Soule makes a point of driving home. It’s called the Black Mercy. I think it’ll make you very, very happy. 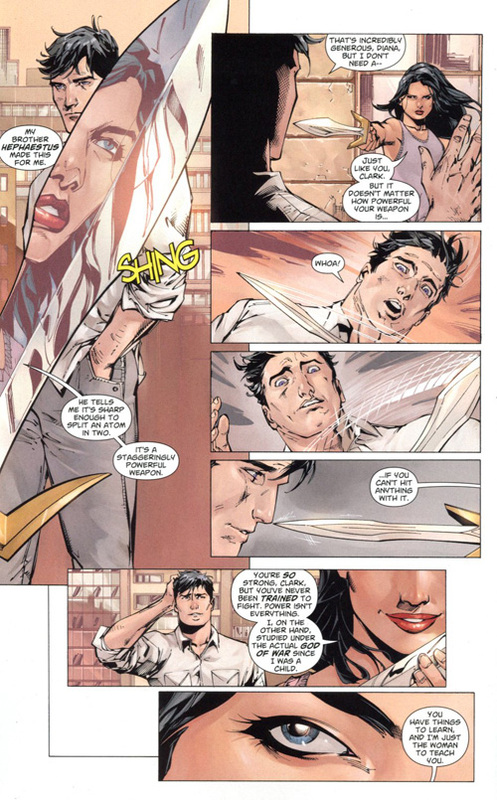 Diana also says she wants to teach Clark how to fight, a topic that’s introduced a little clumsily but ultimately is a good point. Wonder Woman is a highly trained warrior, and Superman really isn’t. He’s amazingly strong and has all these powers, but outside of them he doesn’t really know how to fight. Diana says she was trained by the god of war, which is true in the new continuity, but it’s also a little disappointing, because it was a lot better when she was trained by Amazons because Amazons are a warrior race. Why does it always have to come down to the male authority figures nowadays? That’s so antithetical to who Wonder Woman has always been. Is this the motion of the ocean speech again? I can never tell. Oh, and the whole storm rescue thing? We still don’t really know what that’s about. They got a call, there are planes and ships in trouble, and they’re trying to rescue people as best they can. But then who does Wonder Woman run into? Doomsday. Friggin’ Doomsday. I guess this might be a spoiler because it happens late in the issue, but it’s hard for me to think of it as one because it’s such a humdrum turn of events. 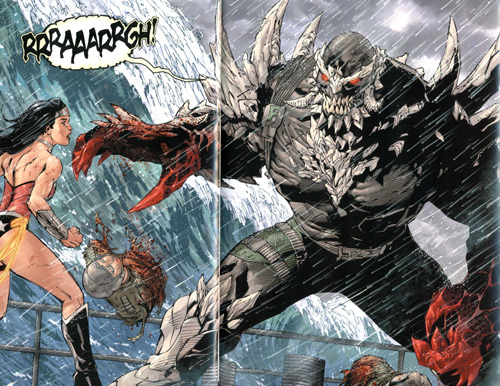 Doomsday is the least interesting Superman villain ever. He’s significant only because he killed Superman in the 1990s. Remember all that media hype about Superman dying? That was Doomsday. He was created specifically for the purpose of killing Superman, and he’s just a mindless, unstoppable, indestructible killing machine. That’s all there is to him. He’s not someone you’d want to go up against, because of the mindless unstoppable killing and the indestructibility, but he’s more a plot device than a character. And that’s pretty much all there is to this issue. It’s not the most promising start. I guess we’re supposed to be worried about Wonder Woman or something because uh-oh Doomsday, but eh. And what did Superman see earlier that made him fly off, all worried? Was it Doomsday or something else? Is he even acquainted with Doomsday in this new continuity? I don’t know that they’ve met. The big brute was only introduced into the New 52 last month as part of “Villains Month,” and I think that was in a one-shot focusing on him alone. Doomsday showing up is always a bad sign, but usually of the writers not having any better ideas than to dig up the worst excesses of the 1990s again.